You have a wish, to be an art expert. More exactly, an expert in paintings. Now, you've got a chance. All you need to do is pass in this test. There are seven fake paintings in here. Your objective is to find 8 differences between each picture and the original picture. You can make only 10 mistakes in each level, so, don't click randomly. Also note that you don't have the original painting here. So, first of all, you need to discover what picture is being showed. To make your job easier you can find the title and author of each painting hidden in it. For this you don't need to click anything, just move your mouse around on the painting to find the hidden clue. Of course, if you know the picture (and maybe you know because you are almost an expert...) you don't need to find it. But you don't have the originals here, so, first of all, you need to discover what picture is being showed. This is just a hint. After this, use some search engine to find a copy and make a comparsion. 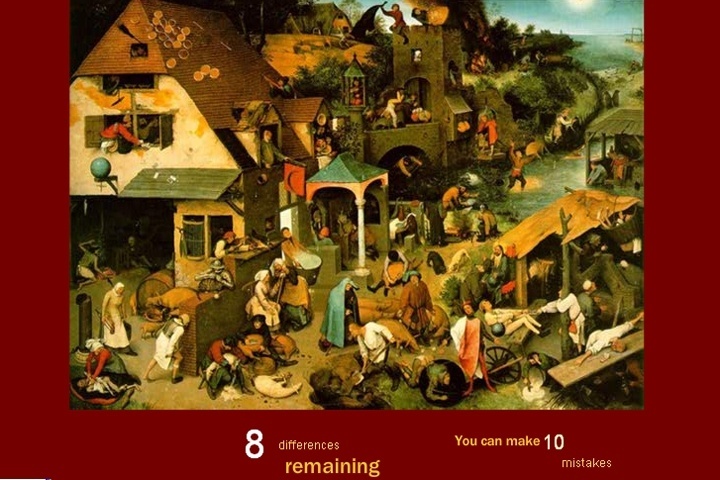 Use your mouse to find the clues and differences in these artworks. Discover what the original painting is, find it on web and compare both. If you want to play Art Expert games online you have come to the right place! GamesLoon adds new Art Expert games every week. This is your game portal where you can find the biggest collection of free Art Expert games online. Do not forget to rate our Art Expert free online games while playing!